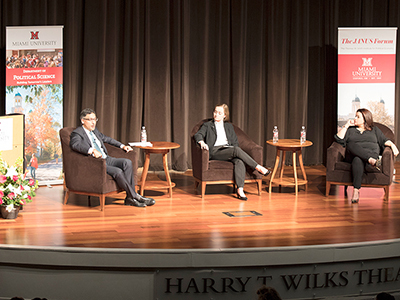 Student moderator Emily Tatum (center) is flanked by Neal Katyal (left) and Ana Navarro (right). On Wednesday, October 17, students, faculty, and community members gathered in Miami's Harry T. Wilks Theater for a political debate discussing the current situation of the Supreme Court and the future of American democracy. The biannual Janus Forum invited prominent legal experts Neal Katyal and Ana Navarro to discuss these topics. Katyal, a Georgetown law professor and former Acting Solicitor General, often agreed with Navarro, a GOP strategist, lawyer, and political contributor to multiple television networks. Questions for the debate were priorly formulated by the Janus executive board and the moderator Emily Tatum, a senior political science, international studies, Latin American and Caribbean studies major. The audience had an opportunity to submit questions on social media by using the hashtag #janusmiamioh. "We're in a new phase of the Supreme Court now, and it's a really different one," said Katyal. The topics of their discussion were very timely. A lot of national attention was brought to Supreme Court Justice Brett Kavanaugh’s confirmation hearing in front of the Senate Judiciary Committee on September 27 because his testimony regarding sexual assault allegations made against him by multiple women was plagued with drama and uncertainty. 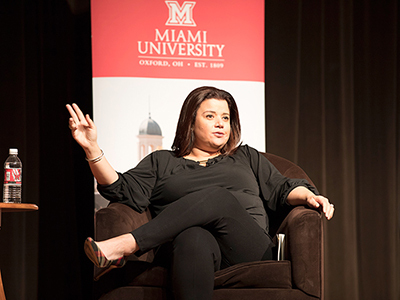 Ana Navarro makes a point during the Janus Forum. "This was a very high-level event," said Navarro. "It was about a topic that is on everybody's mind after the recent Supreme Court confirmation hearings." The debate focused on the highly-watched confirmation hearing that sparked a deep division in the country. This guided Navarro and Katyal to a discussion about the importance the court has in being politically independent and in having the American people feel trust in it. "I think [Chief Justice John Roberts] is painfully aware of the damage to the Supreme Court from the Kavanaugh hearing," said Navarro. "He's going to be proactive in restoring the faith of the court." The biggest discussion of the night came when Tatum asked the panel their view on the recent politicization of the nomination process and the long-term effects it may have. "The fact that we have a confirmation process is interesting," said Katyal. "One of the things that's going to happen as a result of this is that the base is going to pressure the president to nominate someone who is a believer." Katyal and Navarro both noted that the confirmation process itself raises skepticism, stating that the office of the presidency has bigger consequences and impacts because of its power to appoint a justice to a lifelong term. Katyal highlighted the political decisions made when choosing a judge by pointing out a candidate who did not make the nomination list. "Jeff Sutton, a very strong conservative judge who sits in the United States Sixth Circuit Court of Appeals, wasn't on the list because he acted with judicial independence," Katyal said. "He upheld Obama's Affordable Care Act, and that knocked him off the list." Navarro argued that due to strong partisan unity, most Democrats — with exception of a few — were ready to reject any nominee President Trump brought forward, and Republicans — also with a few exceptions — were ready to confirm them, regardless of who it was. "We've got to get back to a Supreme Court nomination and confirmation process that is more truthful, honest, practical, and more real," said Navarro. The audience asked the speakers whether they believe the legacy that justices leave is as strong as it's made it out to seem. This question opened up the discussion that it's not just the Supreme Court that the president has the power of appointing, but it is also the lower courts, including the court of appeals, which have equal importance. 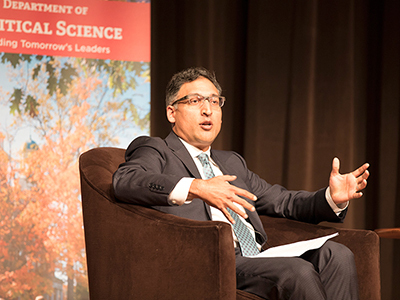 Neal Katyal addresses the Janus Forum audience. "If I took a list on the day after the election and wrote down 40 conservative smart-thinkers, 25 of them are already in the court of appeals," Katyal said. "No president has done anything of this intelligence and capability." "There's no underestimating the effects of this legacy," said Navarro. "There are reasons why he's appointing such loyal, reliable conservative judges." Although there was a general agreement between the two throughout the event, the question of whether lifetime appointments are necessary for judges brought disparity between them. Navarro, an institutionalist, disagreed with Katyal's idea of changing the term to 18 years. She believes that there have been some justices who have proven they can evolve and enjoys the idea of there being institutional memory. However, she believes there should be a point where they ask themselves if they are fit. "[18 years] would mean each president would have two appointments in their 4-year term," said Katyal. "It doesn't make sense now, and I think there're other ways to protect independence." As for what the future holds, Katyal doesn't see much excitement coming ahead. According to him, there won't be any big Supreme Court decisions this year or the next because of institutional concerns. However, both are going to keep a close eye on Kavanaugh and on the attorney general because they hold a special power as well. "When I was representing Hawaii in a Supreme Court case, I really noticed how important state attorneys general are in keeping the executive branch to our continual values," Katyal said. "I think it's really important to pay attention to those." There was a reception following the debate in the Armstrong Student Center. Attendees were encouraged to attend a catered buffet and take the opportunity to talk to both debaters. "With the political environment being so polarized, having people be able to come together and talk about things that are controversial or touchy is very helpful for our democracy," said Brian Egold, a sophomore math education major. "We had the perfect ingredients that made for another fantastic Janus Forum," said Dr. Bryan Marshall, professor & chair of political science. "A packed house, engaged audience, and the timing coming right after the Kavanaugh hearing could not have been more opportune for an evening of serious discussion about the Court's future direction as the nation's balance wheel." The Janus Forum is sponsored by the Thomas W. Smith Institute for Political Economy and the Miami University Department of Political Science. It is made possible through the generous support of The Thomas W. Smith ('50) Foundation.